Quantum Tape Backup Drive 8-00504-01 ASM LTO4 UDS3 FC. In original packaging. Full working order. Quantum TC L32BX Ultrium LTO3 External Tape Drive. INCLUDES MAINS POWER LEAD. TESTED IN WORKING ORDER. HP STORAGEWORKS ULTRIUM 960 EXTERNAL TAPE DRIVE - Q1539B. Up To 800GB Capacity. 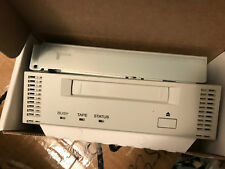 For sale is this HP StorageWorks Ultrium 960 External Tape Drive. The HP StorageWorks Ultrium 960 external tape drive is now 100% RoHS compliant. Sony 5.25" DDS3 DDS2 DDS For SDT-9000 SDT-7000 SDT-5000, SDT-4000 AND RAILS. The HP BRSLA 0601 DC LTO4 Tape Drive PD098N has been fully tested and is working. INTERFACE TYPE : FIBRE CHANNEL. TAPE TYPE : LTO. KEY FEATURES NATIVE DRIVE CAPACITY : 800GB. COMPRESSED DRIVE CAPACITY : 1600GB. 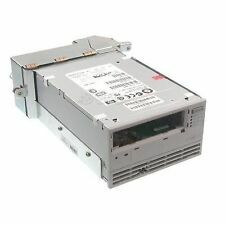 Perfect condition Quantum TC-L52AN LTO5 Ultrium 3000 HH SAS Internal tape backup drive. LTO-5 Ultrium 3000. 6 Gb/sec SAS. Buffer size. Recording technology. Storage capacity. Data transfer rate. AES 256-bit. 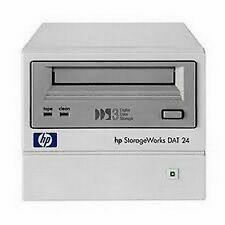 The HP DW027A StorageWorks DAT72 DDS5 USB External Tape Drive has been fully tested and is working. Hp Storageworks Ultrium LTO4 EH922B 1760 HH SCSI External tape backup drive. Perfect condition HP Storageworks EH922B Ultrium LTO4 1760 External SCSI HH Tape backup drive. LTO Ultrium 4; LTO Ultrium 3. LTO-4 Ultrium 1760. Ultra320 LVD SCSI. Buffer size. Logical recording format. Fully tested and supplied with a 90 day warranty VAT Included Mainland delivery included Drives available. (LTO3, LTO4, LTO6, LTO6) Rails available for an extra cost. HP EH847B LTO-3 Internal Tape Drive. - HP AE459B 1U SAS Rack Mount Kit. - Rackmount Rails for AE459B. - SAS Cable. Tandberg Data Ultrium LTO4 3504-LTO 1760 HH SAS Internal tape backup drive. Perfect condition Tandberg Data 3504-LTO Ultrium LTO4 1760 Internal SAS HH Tape backup drive. 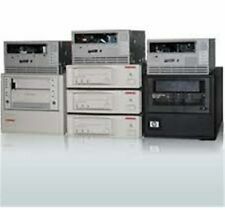 Recording format: LTO Ultrium 4 LTO Ultrium 3 (For 400GB tape). LTO Ultrium 2 (Read only). LTO Ultrium 3 (Read and write). Perfect condition HP Storageworks Ultrium LTO4 1840 Internal SCSI FH Tape backup drive. LTO Ultrium 4; LTO Ultrium 3. LTO-4 Ultrium 1760. Ultra320 LVD SCSI. Buffer size. Logical recording format. Recording technology. 1x IBM 3572-S4H- Tested for Key Functions. This item is in used but good working condition. Tested for Key Functions/ R2 Ready for Resale. FACTORY SEALED, NEW OPEN BOX, REFURBISHED = Tested for Full Functions, R2/Ready for Reuse. This Archive Drive Unit accepts any type of data files just like other IT storage. With its longevity and reliability, this is an ideal solution for preserving AV contents. Sony ODS-D55U Optical Disc Archive Drive Unit that is New with the Original Box. Magnetisch optisches Laufwerk. SMO-F561-70 ). (vermutlich ähnlich wie z.B. 5.25", SCSI-Anschluß. 5 x HP C8010A DAT72 Bänder. - 1 x DELL CD72LWH Laufwerk. Wie auf dem Bild zu sehen. SHELF CODE: P25B 23/04 7 OB. WHAT'SNOT INCLUDED: - Other accessories / Cables / Software / Installation advice etc. WHAT'S INCLUDED: - Unit ONLY. TAPE DRIVES ARE NOT INCLUDED . Technical Sales Executives. LTO Ultrium 4-H. gewöhnliche Gebrauchsspuren und Kratzer. Für Verbraucher nach § 13 BGB Daher weisen wir ausdrücklich darauf hin, dass wir kein Fachbetrieb sind, für diese technischen Geräte. Fully tested and supplied with a 90 day warranty Mainland delivery with UPS Included VAT Invoice supplied. QUANTUM TC-L32AX LAUFWERK. QUANTUM TC-L32AX LAUFWERKohne Zubehör ! LTO-3 WORM (read/write) 400GB native capacity. LTO-3 (read/write) 400GB native capacity. LTO-2 (read/write) 200GB native capacity. IBM Part No. 46X6071 Version 2. 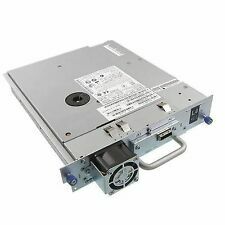 HP EH957A StorageWorks LTO-5 Ultrium 3000 SAS Internal Tape Drive. 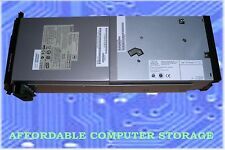 Capable of data transfer rates up to 280 MB/sec, HP. Model: 124T. Dell PowerVault Tape Autoloader. Dell Powervault TL4000 LTO Ready Autoloader chassis. Drives also available. Fully tested and supplied with a 90 day warranty. VAT and delivery also included. 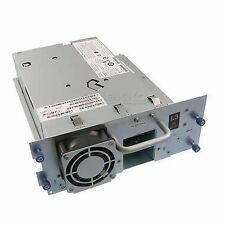 IBM 5746 800/1600GB LTO4 Ultrium Tape Drive, Tested online in an iSeries 8203-E4A with system save and Long Test checkout. 1x Dell PowerVault 124T 'Previously Owned. PREVIOUSLY OWNED, TESTED FOR KEY FUNCTIONS = Tested for Key Functions, R2/Ready for Resale. FACTORY SEALED, NEW OPEN BOX, REFURBISHED = Tested for Full Functions, R2/Ready for Reuse. Overland NEO100S 8 Slot LTO Ready Autoloader Comes with magazines and PSU, no drives but these are available at extra cost. VAT included, mainland UK Delivery included with UPS Rails not included. MODEL: 309833101. MANUFACTURER PART NUMBER: 309833101. ITEM CONDITION: Used. ITEM ID: 118949. As such, once an order has been placed, we are generally unable to cancel the order. SKU: SB-118949. No longer needed at our facility.